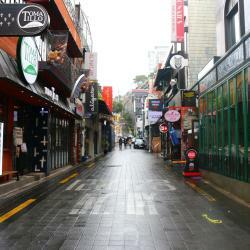 Looking for hotels in Jung-Gu? ENA Suite Hotel Namdaemun provides air-conditioned accommodations in Seoul. With free WiFi, this 4-star hotel offers a 24-hour front desk and a business center. Lovely hotel! Clean and close to everything! Great value for money! Designed with a cinematic theme, Hotel28 Myeongdong is Korea's first hotel to be a member of Small Luxury Hotels of the World Ltd. Beds compy, large room , great shower. Conveniently located a mere 1476 feet from Euljiro 4-ga Subway Station (Line 2 and 5), Acube Hotel Dongdaemun offers free WiFi and an on-site restaurant where daily breakfast is served. There are no any eggs or cakes for breakfast but, all of foods for breakfast was very fresh and delicious. Located in the popular Myeongdong shopping district, Creto Hotel offers modern guest rooms and free WiFi in all areas. Guests can enjoy soft beverages and light snacks at Nescafé on the ground floor. The staffs was so helpful and friendly.. location is 5 mins walk to Myeongdong shopping street and 3 mins walk to exit 10 Myeongdong station. Bed and pillows was very comfy. They cleaned the room everyday inclusive of changing the bed sheets, towels, slippers and they did refill the mineral water bottles every day. I appreciate it because i only drink mineral water. Definitely will come back again. Established in 1960, Metro Hotel is the first government-registered tourist hotel that has been providing comfortable and convenient rooms for both international and domestic visitors. Nice room and convenient location. All you need for a great time in Seoul. Super friendly staff. 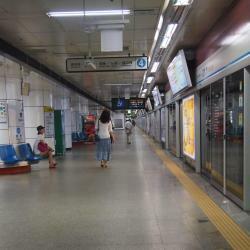 Within a minute stroll from Euljiro1ga Subway Station (Line 2), Small House Big Door offers brightly designed rooms. Free WiFi is accessible throughout the hotel. Loved staying at Small House Big Door! My boyfriend and I were traveling around South Korea for a several weeks and stayed at SHBD on three separate occasions, and the staff couldn't have been nicer. We also managed to sample three different rooms at the hotel and they all were slightly different in layout, but all consistent in their comfort, amenities, and cleanliness. There's a great little restaurant in the lobby of the hotel, not to mention numerous places to eat and drink on the street and within easy walking distance. 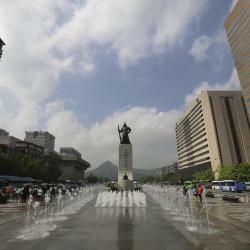 The location can't be beat, so close to all kinds of attractions, eateries, museums, parks, as well as bus and subway lines. Can't recommend enough! Set in the central area of Seoul, The Shilla Seoul is the Forbes-nominated 5-star Hotel of 2019. The hotel features 6 dining options and a full-service spa. I don't have a lot to say - It's still home to me .. I love it ..! L'Escape Hotel is located in Seoul and has a fitness center and a bar. Boasting a 24-hour front desk, this property also provides guests with a restaurant. Free WiFi is at guests' disposal. We are very happy that our first stay at L’escape turned out to be great. Conveniently located 820 feet from Euljiro 3-Ga Subway Station (Line 2 and 3), Nine Tree Premier Hotel Myeongdong 2 houses an on-site buffet restaurant, a bar and a fitness center. The friendliness of the hotel's staffs. Tmark Grand Hotel Myeongdong enjoys a convenient location in front of Hoeheyon Subway Station (Line 4) and is 2461 feet from the popular Myeongdong shopping area. 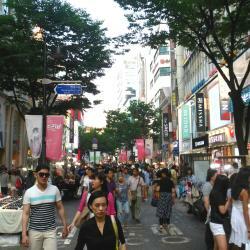 New hotel located conveniently between Myeongdong and Namdaemun. Open from October 2015, Crown Park Hotel is located under a 5-minute walk from the popular Myeongdong shopping area and Lotte Department Store. 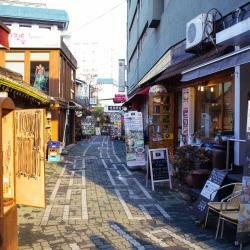 Super convenient location just behind Lotte Young Plaza in Myeongdong. Close to airport bus stop. Ibis Styles Ambassador Seoul Myeongdong offers stylish accommodations just a 2-minute walk from Myeongdong Subway Station (Line 4). Great location! Would definitely stay here again. Conveniently located under 5 minutes’ walk from Myeongdong (Line 4) and Chungmuro (Line 3 and 4) subway stations, Staz Hotel Myeongdong 2 offers on-site restaurants and property-wide WiFi access. I have stayed in this hotel last year 2 times and now 2 times in triple room. Hotel Skypark Kingstown Dongdaemun enjoys a prime location 1148 feet from Dongdaemun Subway Station (Line 1 and 4) and just a few steps away from Dongdaemun shopping district. excellent location. clean and big room. many plugs inside the room for battery charging. 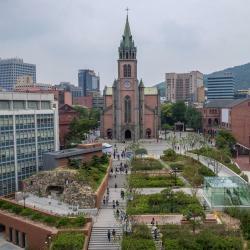 Sotetsu Hotels The Splaisir Seoul is a 5-minute walk from Exit 7 of City Hall Subway Station (Lines 1 and 2), an 8-minute walk from Exit 7 of Hoehyeon Subway Station (Line 4) and 984 feet from the... The beds were so comfortable after a long day walk. Offering an in-house fitness center and a café, Lotte City Hotel Myeongdong is located a 3-minute walk from Exit 1 of Euljiro3-ga Subway Station (Line 2 and 3). The convienant store (7/11) was inside the hotel and that made things very easy. 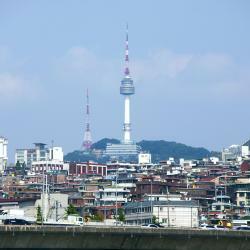 New Kukje Hotel enjoys a great location just 984 feet from Gwanghwamun Subway Station (line no. 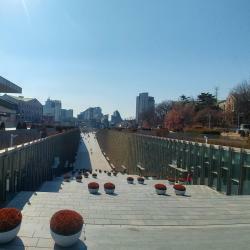 5) and a 2-minute walk from Seoul Cityhall. The hotel was in an excellent location, right by City Hall Station.